Do you know how much you’re paying out for using your cards? DO KNOW HOW much you’re paying your bank every time you take out cash at an ATM or use your card for contactless payments? And let’s not forget about those maintenance fees. Mark Whelan from price comparison site, bonkers.ie told TheJournal.ie that “the days of free banking are long gone”, but added that customers can make sure they’re getting the best deal for them by being aware of how much they’re being charged. This is an increasingly popular and incredibly handy way to pay for your €2 flat white every morning, but customers should know the cost of this convenience. While AIB are set to charge 20 cent for each contactless payment from 24 February, Permanent TSB customers can actually make money as the bank will give 10c back for every contactless transaction under the bank’s Explore Account. It will pay out up to a maximum of €5 per month – that’s 50 contactless payments. 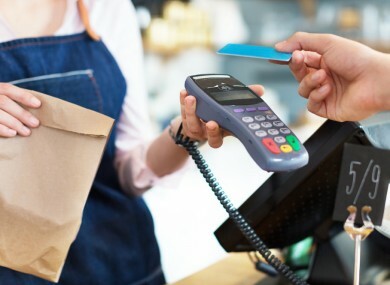 AIB have since announced that from 24 February they will continue to waive contactless fees. Maintenance fees are another charge that each bank applies, however customers can usually avoid them by meeting certain criteria. Whelan added, “Most banks do still offer ways to avoid those maintenance and transaction fees, which can really add up over the course of a year. The criteria that must be met to avoid fees with one bank, may be a lot easier to meet than the criteria set by another, depending on each person’s spending habits. Permanent TSB – with the bank’s Explore Account, customers are charged €4 every month, but this can be offset by the fact that the bank will pay back 10c on every debit card transaction.However, this is capped at €5 a month. So, it is possible to actually make €12 over the course of a year. Email “Maintenance fees, contactless and ATM charges - here's how much you're paying your bank ”. Feedback on “Maintenance fees, contactless and ATM charges - here's how much you're paying your bank ”.